Good day friends! Well, after the last unsuccessful race outing (in my mind anyway), it’s time to put that in the past and look at another race I took part in. 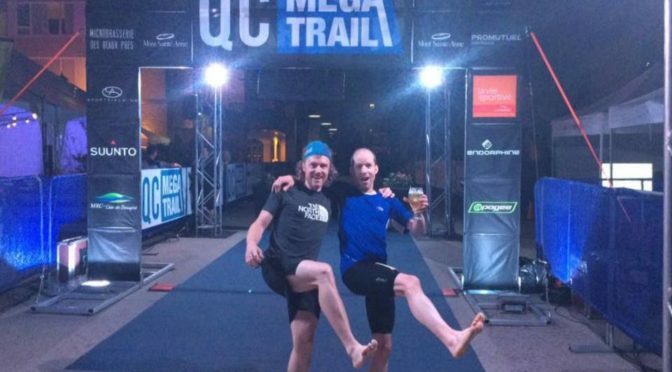 This would be my first long ultra of the season, the 100km Quebec Mega Trail, taking place around Mont Ste Anne in Quebec. The race took place over the July 1st long weekend, so we opted to make a fun weekend of it, hanging out with friends before and after the event. 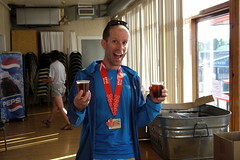 All others were doing shorter distances, but I figured I should still be fine for some post-race celebrating! Read on to learn more about this race, and how I fared on the inaugural running of the 100k distance! As I trotted around the turnaround point of the run loop to head out on my 2nd loop of the 10.5km run course, I made the final decision. I would NOT upgrade myself to the full iron-distance event by doing an additional 2 loops after this one. It had been a scorcher of a day on the course so far, and completing the Epic-distance race, as originally planned, would be plenty enough racing for me on this fine Canada Day in Dartmouth, Nova Scotia. After all, I would still have raced 205km by the time I crossed the finish line! Welcome to the inaugural Epic Dartmouth Triathlon in Dartmouth. Deanna and I had driven from Ottawa to spend time with family, take in the sights, and for me to take part in yet another excellent endurance event, all in a whirlwind 6 days. Read on for the full story, check out pictures of the race and of the touring (including paddling near Peggy’s Cove as well as watch the video review I pulled together for Get Out There Magazine. The decision to make the long driving trip out east again this year came about quite early in the year. I’d caught wind of a new race that was being created in Dartmouth, and the race director was looking for racers to sign up for his inaugural event. The timing seemed to work, and I thought it might be a good chance to visit with my dad again, and this time, make a trip to Halifax, since that was one spot we’d missed last year (along with Peggy’s Cove). Also, another friend of mine, Mike Caldwell, was also eager to commit. What’s more, we hatched a plan to actually hop on the motorbikes and make it a big road trip as a little group. Well, fast forward to late June, and plans changed slightly. Due to problems with dates and schedules, we were no longer all traveling together. Furthermore, we’d also decided (quite wisely) NOT to travel by motorbikes. A few short roadtrips showed us quickly how much longer traveling by bike takes, and we just didn’t have the luxury of time if we were going to visit family and friends. Also, as luck would have it, Deanna’s parent also managed to make a trip out east to coincide with us, which meant our parents would meet for the first time! Pretty good idea seeing as the wedding is just over a year away 🙂 At any rate, this post is mainly about the race, so let’s move on to that, shall we? I was once again slated to cover the event for Get Out There, so as per normal, I had 3 cameras in tow with me, and was bound and determined to attend most aspects of the weekend. We did miss the welcome dinner and race briefing on Friday night, but the race wasn’t till Sunday, and we were in Pictou with family. However, we showed up early on Saturday to the race check-in and transition area. This gave me lots of time to scope out the layout, as well as chat at some length with Tim, the Race Director. He has put in a herculean effort to make this a true destination race that will grow over time, and after having attended this first edition, I’m sure he’s well on his way. To give you all a very quick overview of the race course, there were, as always in triathlons, three legs. The opening swim, the bike, and the run portion. This event was unique in that it had three options. Namely, the ‘Aqua Dartmouth’ the ‘Epic Dartmouth’ and the ‘Iron Dartmouth’. All three options involved swimming 3.8k and cycling 180km. In the Aqua, it stopped there. in the ‘Epic’ you ran a 21.1k course. Finally, in the ‘Iron’, you run a full 42.2k course to finish off. I had chosen the Epic with the expectation that even after finishing, I should be fine to do some touring by foot around Halifax. Another unique aspect of the race was that you could start at one distance, and change on the fly. For example, some participants registered in the ‘Iron’ distance, but due to heat and/or not really feeling it, they ‘downgraded’ to the ‘Epic’ distance. That was a nice option. The intention of this was to ensure that as many people as possible finished the race. Now on to the actual race synopsis. The 3.8km swim all took place in Lake Banook, right in the heart of Dartmouth. This facility has actually been home to at least 4 world championship paddling events in the last decade, and is very well set up for this sort of thing. There are no less than 3 paddling clubs within spitting distance of each other on the water there. There are also permanent buoy lines stretching along the lake, and lots of great spectator options to watch the fun. Owing to these facts, the water was very calm, and there were even lines you could sight off in the water which meant you didn’t have to keep looking ahead to make sure you were headed straight. The race itself started at 7am, which actually seemed to be a pretty reasonable start time. Water temperatures were around 21-22 degrees C, and everyone (except Mike) wore a wetsuit. On account of only having gone swimming 3 times this year, I seeded myself towards the middle, and just planned to get ‘er done. In the water I didn’t feel very fast, and was sure I was losing tons of time to others. Fast forward to the exit, and my watch read 1:09! That was my fastest swim split yet. I was 8th out of the water, and had even beaten Mike, a stronger swimmer than me. I was flummoxed! Happy to take it though. I jogged over to the wetsuit stripping area and let the volunteers disrobe me of my neoprene cocoon. From there, it was a 100m or so jog to the transition area, and the giant circus-like tent where I could change into my super-hero biking costume (well, not quite, but I feel fast when I wear it…). Since I’d had a quick swim, I languished a fair bit in the first transition, and I think I had the slowest transition of anyone, but I had to fiddle with camera set-ups, and took an extended lavatory break as well. I knew it would be a while before I could take a rest, so I took advantage! 180km. Anyway you slice it, that takes a while to pedal. Even longer depending on the weather conditions and pavement conditions. This bike course had a bit of everything in the mix. While the pavement was for the most part pretty new and smooth sailing, there were sections that went against that trend. Unfortunately, they also seemed to be combined with the biggest climbs, and the gnarliest winds. The basic layout was an out and back 90k leg, so in theory, if it was headwinds in one direction, you’d have a tailwind in the other direction. After the swim and my lethargic transition, I felt pretty fired up to get on the bike and put in the mileage on the asphalt. I settled into a pretty decent speed of just over 30km/hr and dropped into my best aero position. My plan was to try and maintain an average speed of 30 the entire way, which would give me a decent bike split of 6hrs. In theory, it would also leave me with enough gas in the tank to run the entire run course rather than have to walk. My previous iron-distance experience was only in Ottawa, and the course was repeated loops. On that course, you did 12 loops, giving you a chance to know exactly how you were doing on average. The challenge here was that there was no repetition, and you didn’t know what awaited you. As it turns out, what awaited us were soaring temperatures, and increasingly challenging headwinds. I still felt good at the 90k turnaround point, where our aid bags awaited us. I loaded my ‘picnic basket’ with food and took back off at my decent clip. Surprisingly, I found myself passing quite a few riders on all the uphills on the way back, in spite of the mounting winds. Although I was feeling a little less energy, I kept motivating myself to push hard to get my 6hr goal. I’m told I looked strong the whole way and maintained a good form. Nice to hear, but I can guarantee you that the final 15k seemed pretty miserable, and I really wanted to get off the bike. However, when the final meters closed, my time was just over 6 hours, so I was definitely pleased with that time over what i consider a challenging bike course. Once again, it was back into the transition zone to change into another outfit to tackle the run. By now, my legs had turned very red from some poor sunscreen application by a volunteer my first time through the tent. This time, I made sure they put a good amount all over my legs, and I did my own arms while they tended my neck. It was still incredibly hot, and the sun was beating down on us, and knowing I had almost another 2hrs out there, I wanted to be safer. I also had to yet again mount my camera again, and this time on my chest, before trotting out. As I jogged out of transition to get on the course again, my spirits were uplifted by the fact that Dad and Nicole were there cheering me on, as well as Deanna happily snapping away with the camera. I took the time to pause and give her a quick kiss before running off merrily into the hot zone. I knew I had 21.1k to run, but in the grand scheme, that really didn’t seem like too much more work before I could rest. For the run, we had a closed loop of 10.5km, which meant I’d have one loop to warm up and get to know the terrain, and my 2nd loop to basically get ‘er done. This run was a combination of surface types. We followed a paved pathway for a good chunk, then ducked into a provincial park where we followed shaded trails for several kilometers, before emerging out onto plain sidewalk paralleling busy roads. The path and sidewalk were mostly exposed and baking, but the woods provided a much-needed respite from the sun at least. The heat was still there, but not quite as intense. As hoped, I had gas in the tank, and managed to keep a run pace the entire way. It flagged towards the end, allowing a fellow racer to pass me in the dying 2 kilometers, but at least I didn’t walk at all. Something to be proud of. I’m quite sure that had I opted for the full iron distance, I may have walked at some point in the final 2 loops. Overall, I quite enjoyed the run course (and bike course for that matter). It was thoughtfully laid out, with aid stations at very regular intervals, all offering water, Gatorade, some with food, and most also with sponges, which were quite useful to beat the heat back. There were lots of volunteers present on all stages of the course as well, smiling and friendly, and quite willing to help in any way they could. As I crossed the finish line, I instinctively raised my arms triumphantly, as so many do at the conclusion of an event like this. Not because I won anything, or broke any records, but simply with the acknowledgement that i once again slayed a beast of a race and put in a great effort that I was happy with. The race director was nearby, and congratulated me, and we had a chance to speak shortly as well. The word was that a lot of people were out there suffering, and this was definitely hotter than anticipated or expected, but the event was still a success by all counts. After finishing, there was some great food to gnaw on, including bagels, fruits and HOT PIZZA with COLD BEER! Yup, healthy victory food for sure. It took me a little while to actually feel up to eating and drinking, instead opting for a quick free post-race massage as well as a refreshing dip in the lake. However, when I finally did eat and drink, it was marvelous. Of course, the real meal was the next day, and featured fresh Atlantic Lobster, and lots of other great food options. This was the official awards banquet, and by having it the next day, all participants were able to rest and recover a bit and therefore show up in high spirits, and willing to relive the day, no matter how tired they had been at the finish the day before. All in all, I give this race a huge thumbs up. Granted, it was a long trip to make for a race, but many people like to seek out a ‘destination race’ to train for, and I think this race would definitely fit the bill for many a triathlete. Check it out online at Epic Dartmouth if you’d like to learn all about it or register for the next year’s event! I’m not sure I’ll make it due to other commitments, but I’d certainly not hesitate to sign up again in the future. From here, I had a couple weeks off before the inaugural Ottawa GranFondo, so stay tuned for that one folks! Canada’s birthday has come and gone once again, and I hope that you all had a great day off to celebrate the birth of this great nation that we live in. Deanna and I started the day off fairly lazily, with a nice breakfast and some chores around the house. A week later, we’d be leaving on our Atlantic Canada tour, where we’d actually be visiting the birthplace of Confederation. However, first up was a nice long weekend of relaxing fun in the Ottawa area. 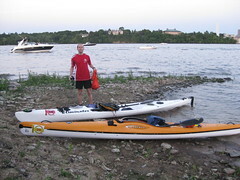 Rather than battling the big crowds downtown as we’d done last year, we had hatched a plan to take our kayaks out on the water and do some paddling, including some geocaching along the Ottawa river and a picnic out there, capped with fireworks. We managed to snap a few picures during the day, which you can check out here. After you had a look a those, pop on back for a bit more about our day. I promise that I won’t be too verbose with this post! With the recent flooding in our basement, Deanna and I had to put any plans of hosting a party at our place that weekend on ice. We had been half expecting some company over the weekend, but a change of plans found us on our own instead, and we decided to just mkae it a relatively quiet weekend. Friday would be the big paddling day, and we’d decided Saturday would be a day spent putting the basement back into a liveabble form since it would be a while before the reconstruction work is done. To wrap things up, we also had a race lined up for Sunday, the Spartan Race. But of course, you’ll be able to read all about that in another post which should follow shortly. We were particularly excited about heading out paddling because I have a shiny new kayak to play with, and Deanna is now the owner of my old kayak, and was anxious to give it a good try. Before setting off, we plotted a few possible routes to take, depending on water and weather conditions. We packed up some lunches inclding a couple single serving tetra paks of red wine. Yum! Slather on the sunscreen, pack up the car, and we were off! We had decided to put in at Lac Leamy and head to the Ottawa river from there. Our route was basically to head downstream to Kettle and the Duck Islands, then swing back upriver to be back around Parliament to enjoy the fireworks that evening. The geocaching itself was also a bit of a challenge where we went. Once we arrived at Kettle Island, there were quite a few revellers at the place where we had planned to pull off to grab some caches. We were forced to go a little further away, and basically bushwhack to get to the cache we were targetting. In the end, it was mainly me doing the hacking as Deanna stood guard by the boats to make sure that they weren’t washed off by waves back into the river. This theme continued for several more caches, as it was much easier for me to hop off my sit-on-top boat and head into the jungles to find the caches. After a few of these stops, I decided that Kettle Island is really like the Lost World. The ferns there are huge, and it is quite wild inland. Not to mention the massive mosquitoes that were feasting on my blood. Oh well, such is the life of an adventurer, right? We carried on in this manner for several hours, grabbing caches and paddling through cool spots. Our last downsrteam cache was particularly fun, and was a pretty tough find, but I perservered while Deanna paddled below the perch where I finally found it. Looking at our watch, we decided it was time to head back upstream, given that we’d have both wind and current against us for the return paddle. Plus, we were getting hungry and decided that supper would be closer to the fireworks. Two final caches were grabbed before we found a nice little island that we decided to call home for the rest of the evening. It was around 8:30, and fireworks would be around 10pm so we had a little time to kill. I tried to dry off a little bit, as the waves and jumping in and out had resulted in me getting quite a bit wet, and the termperatures were now dropping a bit with the setting sun. We busted out the supper we’d packed, and casually chowed down while watching the growing armada of boats assemble in the water for the fireworks. The big show started right on time at 10pm, and as usual, this was a show not to be missed. This would have been perfect had it not been for all the mosquitoes that were attacking us! 15 minutes later, it was time to head back to the car. I put lights on the kayak, and we turned on headlights and flashing rear lights on our PFDs. This is when the final fun started. It was now pitch black, and there were a ton of boats all speeding away from the area, causing all kinds of turbulent waters. When we reached the intersection of the Ottawa and Gatineau rivers, things got pretty hairy. There were massive cross-waves, and I couldn’t see any of them due to the dark. I was SURE I was going in. Especially when my entire boat was swamped by the waves twice in a row. I was basically sitting in a bathtub of water. However, I popped by little self-bailer and kept paddling as best I could. Remarkably, all the water drained out, and I stayed in the boat! I was actually quite surprised (and happy!). The end of the paddle went fairly smoothly, and once out, we loaded the boats and all the gear back on the car and headed home wet but happy. 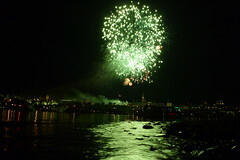 It had been a great day on the water, and we’ll definitely be back there again next year for the July 1st celebrations. Time to rest up again, and get ready for the Spartan Race on Sunday. As another distraction on Saturday, we even went to the movies and saw X-Men First Class. Great movie! Here endeth my short story about paddling on Canada Day, and hope you all were able to enjoy the great weather with family and friends as well. Up next: Spartan Race Report. Good day friends and followers of the world! Just thought I’d pop on here and give everyone a bit of an update on what’s been new with me. When last you checked in, I had been racing my brains out in my toughest 3-day solo race yet, with great success! So since then, you probably think I’ve been training hard and getting ready for the next challenge, right? Well, not really. Instead, I declared July to be my month of relaxing, enjoying life, and spending time with the people that really matter in my life 🙂 Yup, that’s right, the lazy days of summer are well and truly here. To those ends, since UXC, I’ve had a great long weekend for Canada Day (Pictures), including some aerial park fun at Camp Fortune (Pictures. I’ve also got my music fix at both Ottawa Bluesfest (Pictures) and Toronto Beaches Jazzfest (Pictures). Wanna hear a bit more about them, as well as what else I have in store? Well, read on dear friends, otherwise, this opening paragraph and pictures gives you a pretty good idea what’s been going on! Aaaaah Summer! That magical 2-3 month window of amazing weather in Ottawa, the canal is filled up, people are out and about on bikes, rollerblades, or on foot; wearing shorts and T’s or skirts and tank-tops. People seem generally happy, and the festive atmosphere carries over to all sorts of events! Now obviously I love being outside and doing stuff year round, but you just can’t beat summer for the sights and sounds around us. Apart from Deanna visiting, there were also other friends from out of town visiting. In particular, Tanya and Troy were up for the week, as well as Megan and Karla. I hosted a bbq / party on Friday night to celebrate, but due to a lot of other people having plans, it was a relatively small gathering. However, it didn’t stop Troy and I from staying up late and playing a little muzak like the old days. Other highlights of the weekend included an awesome and beautiful Canada Day, spent downtown on rollerblades, moving from venue to venue. I even managed to get a picture of the Queen waving to Deanna from her car! Hopefully that made Deanna’s nana’s day! To close that day, we did what any true patriotic outdoors-loving Canadian would. We portaged a canoe to put-in downriver of Parliament, then paddled up to enjoy some wine and the stunning fireworks show (no thanks to the patrolling police boats!). It was an absolutely perfect way to finish the day; just the two of snuggled in a Canoe watching the fireworks go off above parliament hill as the water gently lapped at our boat, and we drank some nice red wine. We also decided to check out the Aerial Park up at Camp Fortune in Gatineau Parc on Saturday. What a hoot that was! Climbing, clamouring, and ziplining our way through the ‘Amazone’ course up there with just the two of us and our ‘guide’. The guide basically stayed below and we had some great banter with him. He clearly was enjoying the fact that it was just two clients and we were more than capable of taking care of ourselves. If you haven’t been up there yet, I’d recommend it. Fun for the whole family, provided their tall enough (I’m guessing!). Judging by the smiles and giggles, I’d say Deanna thoroughly enjoyed it too. Later on, we had a great meal at Shanghai in Chinatown, then spent a really nice lazy day around the house on Sunday. All in all, a near-perfect weekend! Once I [sadly] sent Deanna back off to Toronto on the train, it was time to start preparing myself mentally for Bluesfest! Yup, as usual, I bought a full pass, and intended to basically camp there for the entire two weeks (apart from the one day that there was no music). It started up on Tuesday the 6th of July, and ran until the 18th. To kick things off, we were treated to Dream Theater and Iron Maiden! Quite and opening night line-up. Obviously, there are sooooo many groups and bands there, I’d get tired typing out everything that caught my interest. There were a number of stand-outs to me though. I’ll list them, but no links. If you’re curious about them, Google is your friend (or Bing, or whatever, I’m not telling you all how to run your lives!). With Bluesfest out of the way for 2010, it was time for a few days of well-deserved recovery (oh, and of course, some training, you didn’t think I’d stop completely did you?). However, the festival-free atmosphere would only last a few days, as the next weekend, it was off to Toronto to stay with Deanna, and also to catch some of the Beaches International Jazzfest. Best part of this festival? Well, it was all free, and all outdoors, so we could come and go as we pleased, and didn’t have to feel bad if we missed any shows! My favourite part of the festival was actually Streetfest. Basically, for 3 nights, they shut down a long stretch of Queen Street east, and bands play outside all along the street. There was a very lenghty roster of bands slated to play, several of which we were keen to check out. Much like Bluesfest doesn’t have an over-abundance of blues, I’d also contend that Jazzfest did not have an over-abundance of Jazz. That’s sort of irrelevant though, as the music was awesome! Our first goal was heading to the big outdoor venue at Kew Gardens on Saturday afternoon. Forecast wasn’t that hot, so we made it a point to dress and prepare accordingly. Sure enough, as we finally closed in on the stage area, the heavens opened up on us! We couldn’t care less though, and stomping around the grass and beer garden with our rollerblades. We got completely drenched and loved every second of it. We agreed as long as we didn’t start to get cold, it was all good. Apparently, it was raining so hard, that even somedogs had to wear raincoats! Wait a second… did I say beer garden? Why yes I did! While we didn’t drink much, we did each have a tasty Mill Street Brewery Lemon Tea beer. Now, Deanna will be the first to tell you she does *not* drink beer. Yet, at this festival, as with Bluesfest the week before, I convinced her to drink this beer! This little fact struck me so much that we went and made a video about it! Ok, so the video is pretty terrible. I was sort of on the spot. If I’d realized that I could win a big brewery party with this video, I would have put more effort into a script or something. Ha ha! Either way, that’s us, up on the Inter-webs! At least we got free swag from it. T-Shirts all around 🙂 If you vote for it, we might even be one of the lucky winners! After Kew Gardens, we headed along the boardwalk to check out some cool latin grooves with steel drums, and tried to find a few geocaches on our way home (mostly unsuccessful as yours truly didn’t have the full information on them). The rain didn’t let up one bit, so we were quite happy to ditch the soggy clothes upon arrival back at Deanna’s apartment. Time for supper. And what did we have? Why breakfast of course. Yum! Bacon and eggs. Fuel up, then headed back out on the blades to catch streetfest, which thankfully was spared the heavy rain. The crowds were back en masse, and we spent about 3 hours up and down Queen checking out some great bands, finishing off with tasty ice creams from the Marble Slab Creamery. To cap the weekend off, we had made plans to head to Toronto Island and/or go for a long run. As often is the case with our tentative plans, they didn’t happen. However, we *did* manage to make it to our reservations at Canoe, one of the highest-rated restaurants in Canada, located high above the city on the 54th floor of a skyscraper. It was an absolute stunner of a day, so we could see far out into the lake, and enjoyed the views of the Toronto Island airport, the Islands, and the boats as we ate an absolutely scrumptious meal as part of the ‘Summerlicious’ promotion, where they offer a ‘prix-fixe’ menu at prices mortals like us can afford. After the meal, some more roller-blading to a couple parks where we enjoyed the mini-escapes that you can find within Toronto if you know where to look. Well, that is until an absolutely nutters lady sort of scared us off a park bench with her crazy ranting to imaginary people right behind us. I’m not judging here, I was just worried she might think we were part of the story arc where she exacts her revenge on society!! That’s what I love about life. Never a dull moment if you’re willing to be out there and do things. So there you have it folks. In a nutshell, some examples of how I *am* human, and do love to just relax and have fun. There’s obviously much more to life than training and racing, and I get the feeling I’ll be doing less of that as time goes on, in order to exchange it for even more rewarding pursuits and activities 😉 There’s just so much to do out there! Hopefully you’re all finding the time to strike out and enjoy the summer as well. This weekend, I’ll be testing my luck once again at a race, but it’s just a short one. Kayak triathlon. And I’ll publicly say it here. I intend to win this one! Hope that doesn’t jinx me 🙂 If it does, I’ll still tell you all about it in my next post! Till then, smile everyone!